Paapa Essiedu and Buom Tihngang with the cast of Hamlet. Photo by Manuel Harlan. So… Hamlet (Paapa Essiedu), goes mad when his dad the king dies, and mom marries his uncle, and he drops Ophelia like a stone, except she floats. But you already knew that. So, I’ll spare you all the deets. What’s refreshing is the eighteen-member troupe – African, British and Jamaican, with the exception of three white cast members, Byron Mondahl as the Professor of Wittenberg, James Cooney as Horatio and Eleanor Wyld as Guildenstern, gifter of English biscuits. And though they speak of Denmark, director Simon Godwin uses themes from both ancient and modern-day Africa to achieve this fresh, new dynamic. (There’s a Wakanda salute from Hamlet to Horatio. Watch for it!) What’s exciting is this alternative perspective – imagining how the tragedy would go down in contemporary society. It’s entirely relatable. 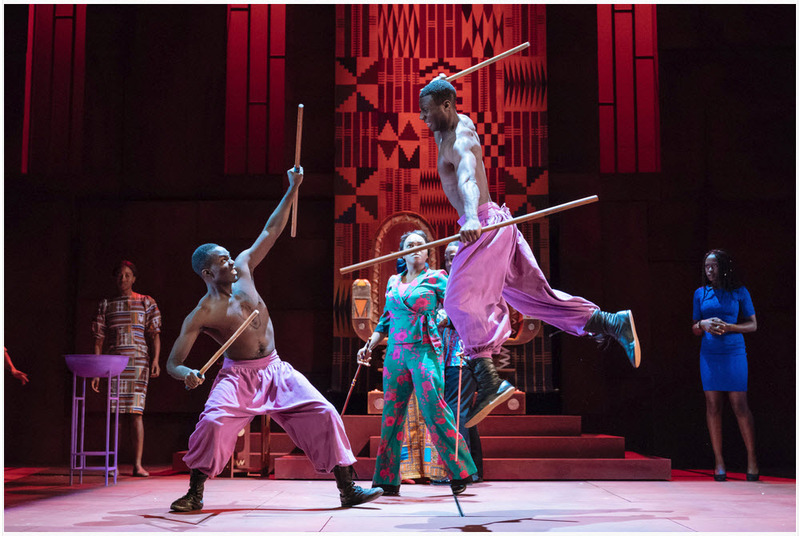 Paul Will’s contemporary design demands richly colored kente cloth costumes and lofty headdresses for Queen Gertrude with formal military dress uniforms for King Hamlet. Palace guards, Barnardo and Francisca, sport stylish camouflage and Cordelia’s four-inch heels and dreadlocks beside Hamlet’s hipster get-ups and drummers in dashikis, assure us we are firmly in the present day. 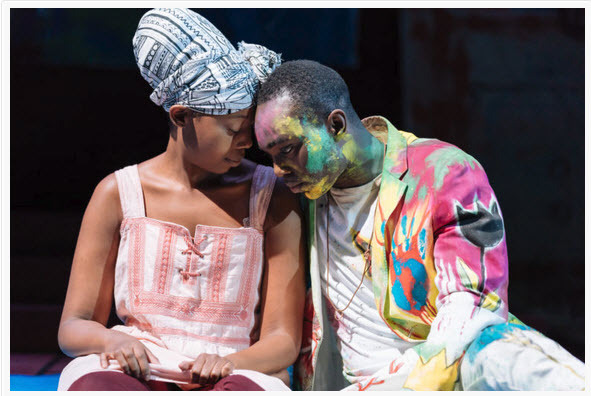 Mimi Ndiweni and Paapa Essiedu in Hamlet. Photo by Manuel Harlan. Will envisions Hamlet as a graffiti-painting, boombox-toting lad who’s gone off the rails. (For some unknown reason, I thought of Prince Harry’s rebellious period after the loss of his mother.) In a mash-up of past and present, the mood shifts precipitously from formal Danish court to ancient African rituals and indigenous dances. As in The Lion King, characters frequently dash down the aisles and leap onstage. Composer Sola Akingbola sets the tone with fierce drumming and African music from calypso to tribal. Of particular note was the ghost of Hamlet’s father, spotlighted up in the balcony, and the handling of Ophelia’s speech about the flowers – fennel, pansy, rue, columbine – as she mourns Hamlet’s repudiation of her love. It is in this tragic scene that she, grief-stricken, pulls out locks of her hair, one for each flower she names, to give to the King and Queen. With Lorna Brown as Queen Gertrude, Clarence Smith as Claudius, Joseph Mydell as Polonius, Buom Tihngang as Laertes, Mimi Ndiweni as Ophelia, James Cooney as Horatio, Romayne Andrews as Rosencrantz, Patrick Elue as Marcellus, Lucianus and Fortinbras, Kevin N Golding as Barnardo and Tracy-Anne Green as Francisca. Direction by Simon Godwin, Design by Paul Wills, Lighting by Paul Anderson, Composed by Sola Akingbola with Fight Direction by Kev McCurdy. What a joy and privilege to experience this brilliant production by a such fine cast!